It seems like Spring brings the best art exhibits! Among these shows is one that has the potential to expand the participating artists’ opportunities. 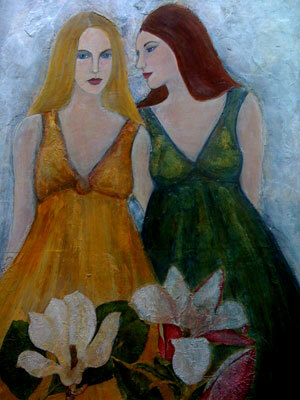 Every year at this time, Artwell Gallery in Torrington, CT holds their Show for a Show exhibition. During the show, more than 50 major art museums and galleries from the tri-state region view the submissions and select works and artists to exhibit in their galleries. 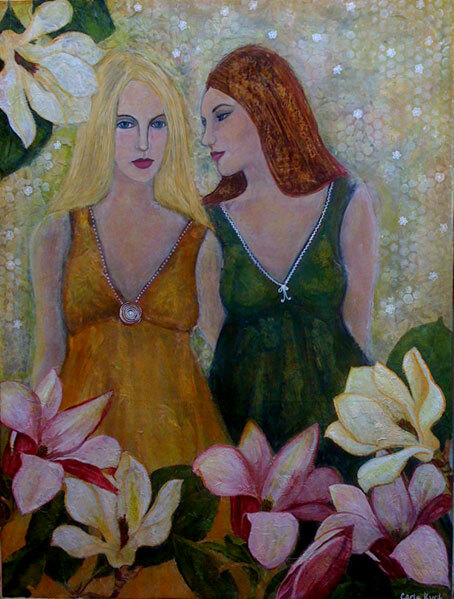 I have decided to enter Flora, a painting I did for the Girls,Girls, Girls show at the IO gallery last spring. 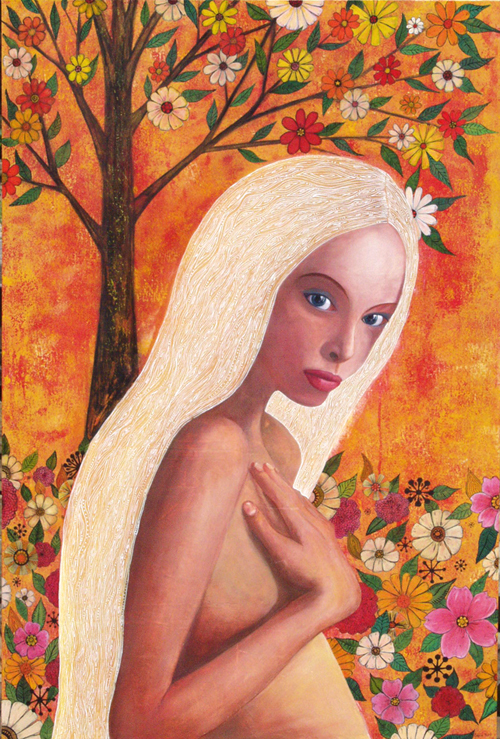 She didn’t sell and has been hanging on the wall of my office, mesmerizing me with her huge eyes and mysterious beauty. I almost don’t want to part with her, but… she may plant some seeds of opportunity for me! The Show for a Show exhibition runs from April 4 through May 17 with the opening reception on April 4 from 6 – 9 p.m.
Edit – 3/38/09 – I’m also submitting her for Illustration Friday‘s topic, Poise. She does seem very poised, yes? 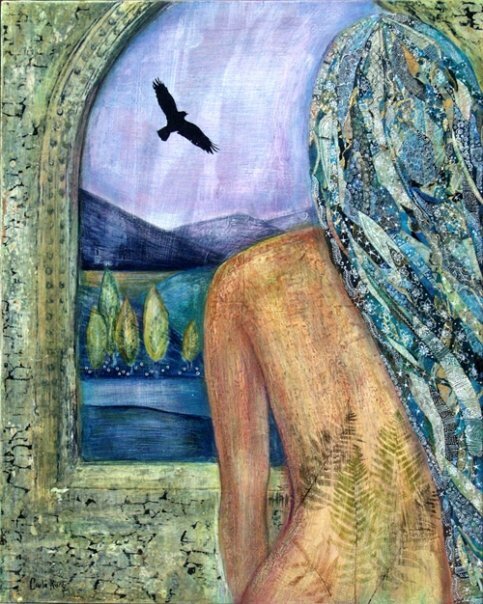 Tonight is the opening of the 4th semi-annual Word-Art show at the Gallery on the Green in Canton, CT. Once again, I had the honor of working with my dear friend, Karen Jasper, who wrote the poem “Wounded Bird” in response to my painting, “On Ancient Wings.” The show runs through April 12, with an evening of readings on Saturday, April 4 at 7:30. To a resting place warm with possibility. Acceptance and choice safely within her span. Into the habitat of hidden. Heedfully whole to fly again. Deeply tucked in grainy sand. What I cannot fathom I will not change. That I was born for just this moment. I pretty much finished this painting, except for painting the sides of the wood panel. I don’t know what I’ll call it, but it’s 12″ x 16″ x 1″ acryclic/mixed media. 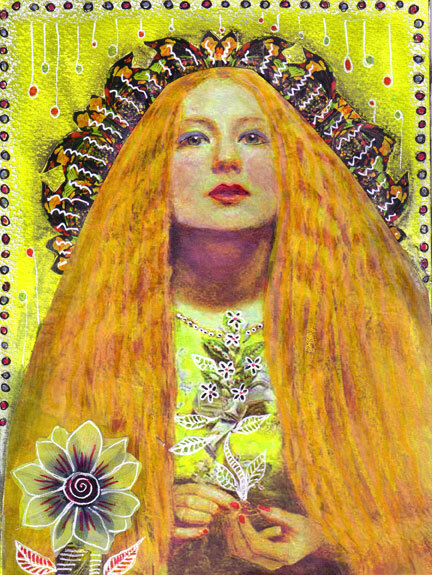 Then I made a SoulCollage card using John Everett Millais’ The Bridesmaid as a central figure. I’ve always been drawn to this painting, so I decided to use her as a basis for a Committee card, adding some embellishments with paint, crayons and pen. It’s been one of those weeks… and I feel like I’ve had one foot in the twilight zone. There’s been such a surreal aura around me – weird synchronicities and strange happenings, but somehow I have managed to hold on to my calm center. 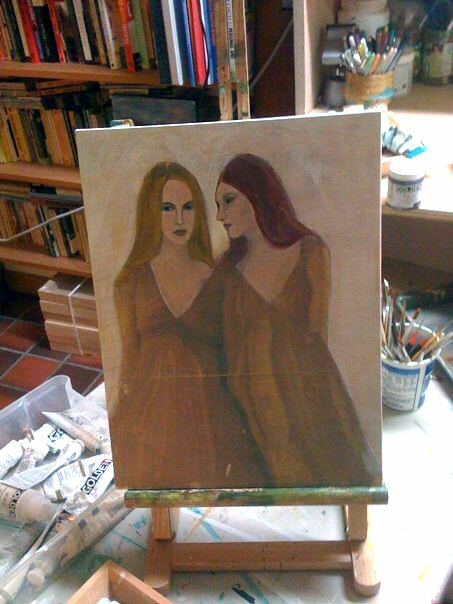 Perhaps all the turmoil has stirred up some creativity, because I’ve started a new painting that I hope to finish by the end of the weekend. 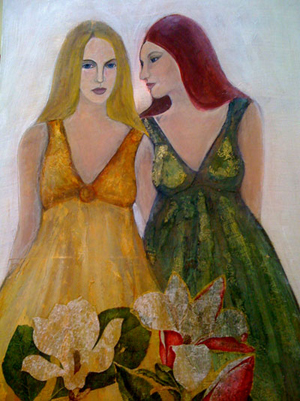 The story is evolving… two friends, a secret, who knows? I guess I’ll have some idea by the time it’s all finished. I’ll simply let instinct and intuition guide the way. 2/21 – here’s some progress on the painting, which I worked on yesterday. I still need to do the background and finish up the detail work on the figures and the foreground, both of which are still rough. The flowers in the foreground are collaged from paper napkins, a technique I first learned about from my friend Lenna Andrews and more recently was reminded of by Sharon Tomlinson’s article in Cloth Paper Scissors. I’m going to need to paint them in, but I really love the fine layer they add! 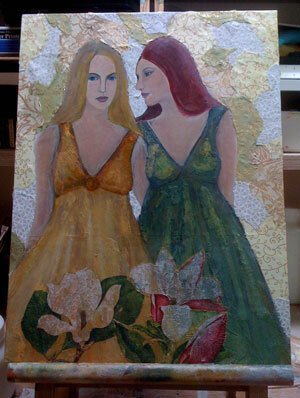 I did a bit more today… I layered on some decorative papers for background texture, and then painted over them. I also did some more detail work on the figures. Now it’s time to let it sit while I ponder the rest of the background.